The Sitobion fragariae aptera is dirty yellowish green (see first picture below), with small brown intersegmental sclerites on the abdominal dorsum. The antennae are about the same length as the body, with the basal segments paler than the rest. The siphunculi are usually entirely black, although they may have paler bases on the primary host. They are 1.8-2.7 times longer than the pale pointed cauda (on blackberry cf. Macrosiphum funestum, which has the siphunculi 2.5-3.5 times the length of the cauda; on grass cf. Sitobion avenae, which has the siphunculi 1.1-1.5 times the length of the cauda). The body length of Sitobion fragariae apterae is 1.6-3.0 mm long. Sitobion fragariae alates (see second picture above) have a pattern of dorsal dark intersegmental markings that is usually more extensive than in Sitobion avenae. The clarified slide mounts below are of adult viviparous female Sitobion fragariae on the primary host (blackberry): wingless, and winged. The clarified slide mounts below are of adult viviparous female Sitobion fragariae on the secondary host (grasses): wingless, and winged. 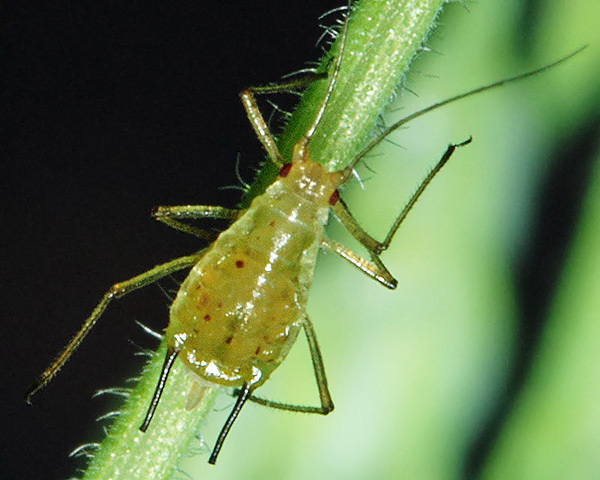 The blackberry - grass aphid host alternates from blackberry (Rubus fruticosus agg.) and occasionally other Rosaceae to grasses (Poaceae) especially Holcus spp. and some sedges (Carex spp). 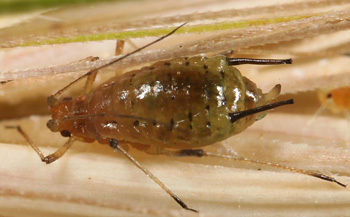 Sitobion fragariae eggs hatch in spring and the young nymphs feed on the breaking buds. Colonies build up and in summer alates migrate to cereals and grasses. A return migration takes place in autumn. Sitobion fragariae has been recorded from 11 Rubus species. Blackman & Eastop list 10 species of aphid as feeding on blackberry (Rubus fruticosus) worldwide, and provide formal identification keys. 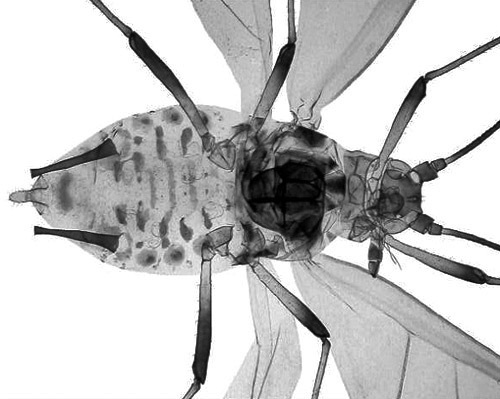 Of those aphid species, Baker (2015) lists 7 as occurring in Britain: Amphorophora rubi, Aphis ruborum, Aulacorthum solani, Macrosiphum euphorbiae, Macrosiphum funestum, Macrosiphum rosae and Sitobion fragariae. Sitobion fragariae has been recorded from 3 Holcus species (Holcus annuus, Holcus lanatus, Holcus mollis). Blackman & Eastop list 23 species of aphid as feeding on 'Yorkshire fog' (Holcus lanatus) worldwide, and provide formal identification keys. 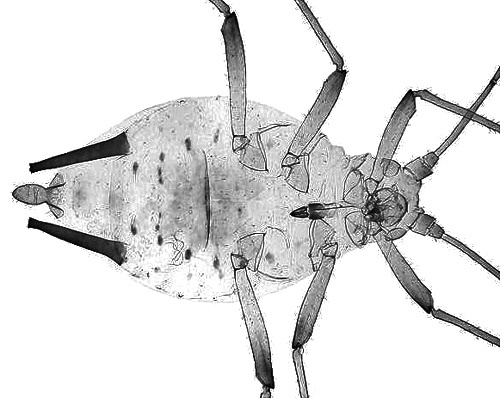 Of those aphid species, Baker (2015) lists 22 as occurring in Britain: Anoecia corni, Atheroides serrulatus, Cryptaphis poae, Diuraphis frequens, Diuraphis holci, Forda formicaria, Geoica lucifuga, Geoica setulosa, Geoica utricularia, Hyalopteroides humilis, Laingia psammae, Melanaphis pyraria, Metopolophium dirhodum, Metopolophium festucae, Rhopalosiphum nymphaeae, Rhopalosiphum oxyacanthae, Rhopalosiphum padi, Schizaphis holci, Sipha maydis, Sitobion avenae, Sitobion fragariae and Tetraneura ulmi. 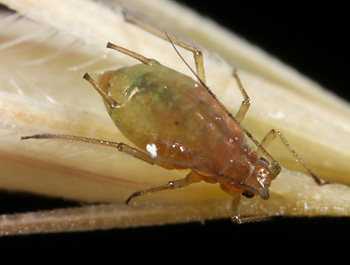 Blackman & Eastop list 11 species of aphid as feeding on 'creeping soft grass' (Holcus mollis) worldwide, and provide formal identification keys. 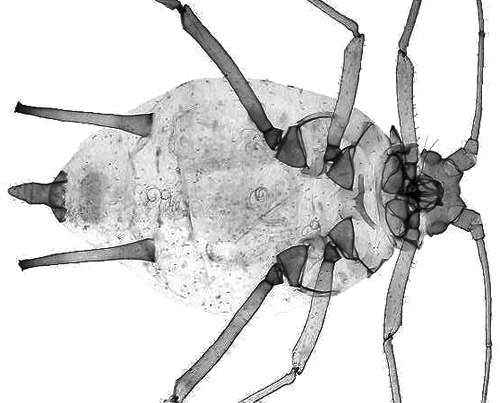 Of those aphid species, Baker (2015) lists all 11 as occurring in Britain: Anoecia corni, Cryptaphis poae, Diuraphis holci, Forda formicaria, Rhopalosiphum padi, Schizaphis holci, Sipha glyceriae, Sipha maydis, Sitobion avenae, Sitobion fragariae and Tetraneura ulmi. Sitobion fragariae has been recorded from 17 Carex species. 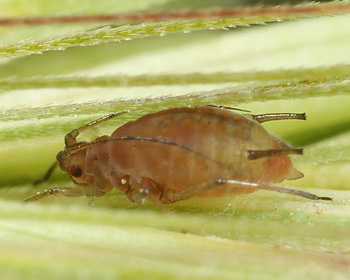 Blackman & Eastop list about 110 species of aphids as feeding on sedges worldwide, and provide formal identification keys for aphids on Carex. 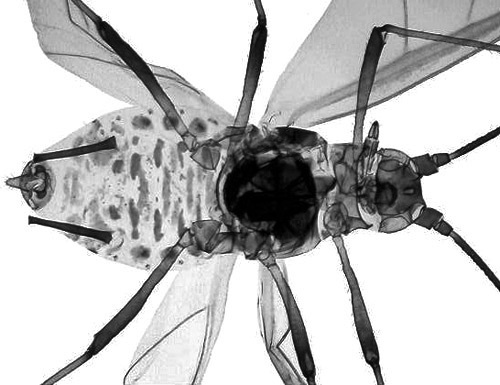 Of those, Baker (2015) lists 32 aphid species as occurring in Britain: Allaphis cyperi, Allaphis producta, Allaphis verrucosa, Atheroides brevicornis, Atheroides serrulatus, Baizongia pistaciae, Caricosipha paniculatae, Ceruraphis eriophori, Colopha compressa, Forda formicaria, Iziphya bufo, Metopolophium dirhodum, Metopolophium festucae, Myzus ascalonicus, Rhopalosiphum maidis, Rhopalosiphum oxyacanthae, Rhopalosiphum nymphaeae, Rhopalosiphum padi, Rhopalosiphum rufiabdominale, Schizaphis caricis, Schizaphis pilipes, Schizaphis scirpi, Sipha glyceriae, Sitobion avenae, Sitobion fragariae, Subsaltusaphis flava, Subsaltusaphis ornata, Subsaltusaphis pallida, Subsaltusaphis paniceae, Subsaltusaphis picta, Thripsaphis caricis, and Vesiculaphis theobaldi. 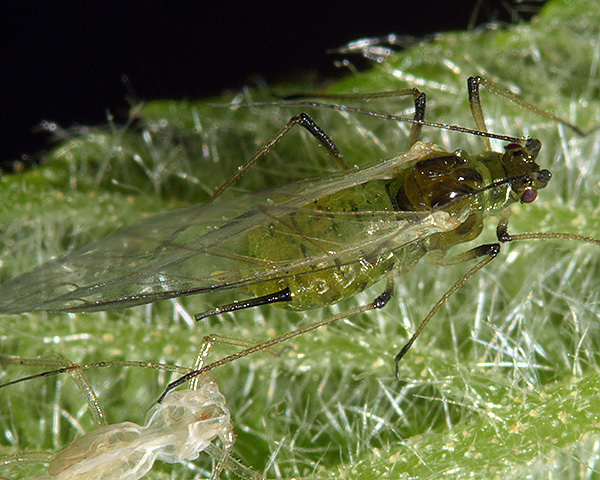 Have an interesting aphid for you, what appears to be a Sitobion. It was found on Wall Barley, Hordeum murinum, on a small pier at Newlyn today. 10.06.14. SW 46490 28497. Juveniles quite orange in colour. Few adults, mostly juveniles on each inflorescence, grass also looked like it was going over, becoming dry and purplish. Hope I have the right genus. Image(s) copyright www.aphotofauna.com all rights reserved. Think I have it, Sitobion avenae! I know it can be rather variable, but I'm not convinced it is Sitobian avenae. Given the host and the dark siphunculi, it is much more likely to be Sitobion fragariae, whose siphunculi are at least twice the length of the cauda.